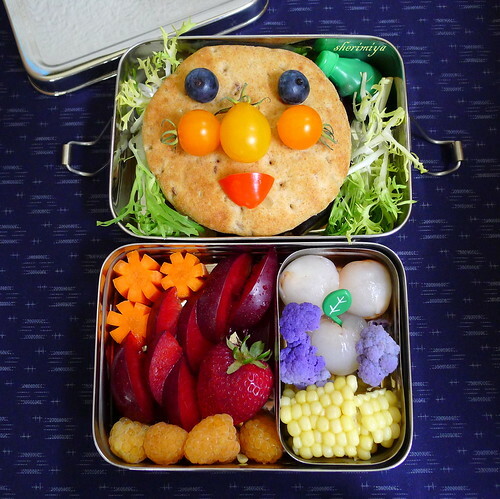 Anpanman Burger Bento, a photo by sherimiya ♥ on Flickr. Today's bento features meeeeeeat! I made beef/turkey burgers for the kiddos. This one is MisterMan's, since it's packed between two whole grain sandwich thins. He can put the frisee inside the burger along with a squirt of ketchup inside the pig bottle. Every time I see a round bun I see Anpanman now. If you go back in the archives you'll see it's true. I made one ages ago here, and a more recent one (that I think looks much better) here, and then a naked burger here. The tomatoes are from my home garden, and the orange sunsugars and yellow pear varieties are doing really well right now. I had to barricade them to keep the dog away, since he loves fruit. I used red pepper for the mouth, and blueberries for eyes. I know, I forgot the eyebrows. Darn! He fit perfectly inside the EcoLunchBox, with the upper tier holding a selection of: carrots, pluots, strawberry, golden raspberries, lychee, purple cauliflower, and corn. I had to slice the tomatoes in half to fit, but the nice thing is that the top pushed everything down so it didn't move around too much, but not so much that it smushed. That's what I call a perfectly packed bento. And the ice cream recipe??? Your lunch is beautiful! 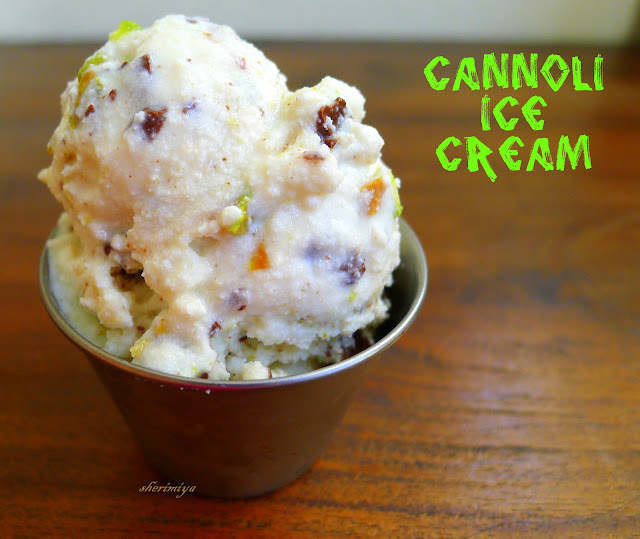 Oh yeah, I used the recipe by Fullbellysisters here: http://fullbellysisters.blogspot.com/2012/08/cannoli-ice-cream-w-pistachios-dark.html except I also added some yogurt which I thought would add to the tanginess. They also suggest serving it in a frozen cone to make a "cone-oli" which I thought was SO CUTE! My children are just starting school (kindergarten and pre-k) so we are new to school lunches ... since this is meat, how do you keep it cold and do you heat it up prior to eating? Our school has a microwave for the students but the younger ones don't use it. My kids wouldn't be opposed to cold meat sandwiches but I am curious how to keep the lunch at safe temperatures. All the bentos I pack for my kids are meant to be eaten at room temp (except the ones I pack in thermal food jars, which I pack hot and which keep the food warm for 4 hours until lunchtime). They are used to eating them at room temp (or sometimes cold), and don't mind it. I keep mostly to foods which still taste good without reheating. Chicken, meatloaf, burgers, bean salads, and the like are ideal. If you plan to pack perishable items such as yogurt or mayonnaise-based foods, I would suggest an ice pack for safety. Otherwise, a few hours at room temp should be fine for most foods. Have fun with your new lunchpacking routines!